By memorizing the following acronym and diagram, you’ll be equipped to evaluate what kind of relationship you’re engaged within any environment. Brene Brown’s “Anatomy of Trust” explains how trust is BRAVING connection with others. Each of the following should be true of both you and the other individual(s) in the relationship. *NOTE: If you help others, but are not willing to ask for help in return, then you are viewing their need for help as a weakness. That is not a trusting relationship. 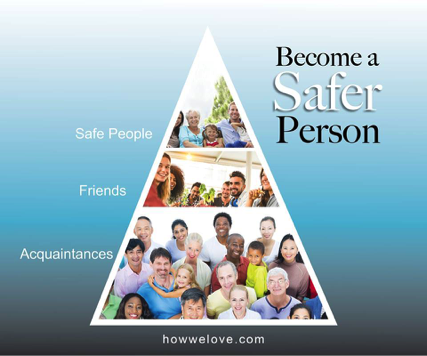 Kay and Milan Yerkovich use a pyramid to demonstrate the different kinds of relationships we engage in, regularly. “All people, including your spouse, enter at the bottom and, over time, earn their way to the top." We all have the internal resources to be tolerant and patient with other human beings. Whether they think similarly or differently from you, each human being is lovable. When we practice BRAVING and are aware of what kind of relationship we’re involved in, we know what is safe to share and how we can best listen or engage in the discussion. Practicing mindfulness will increase your ability to understand what is happening with your own body, emotions, and thoughts in response to another person’s words or actions. The understanding allows you to regulate your response, reducing reactivity, as you maintain tolerance. Still, tolerance does not mean safe. Be aware of the signals your body tells you. And, when you’re questioning your own discernment, those you know are safe people can help you reclaim your sense of self. It is in these discussions between safe people, where one or both are in their vulnerable state of “help me to understand” that we connect and grow more intimately sure of who we are and how we relate with others and the world at large.